Armourers Hall is the home of The Armourers’ Company which was founded in 1322 and has occupied the same site in the City of London since 1346. The Company is now one of the leading charities in the UK, supporting metallurgy and materials science education from primary school to postgraduate levels. 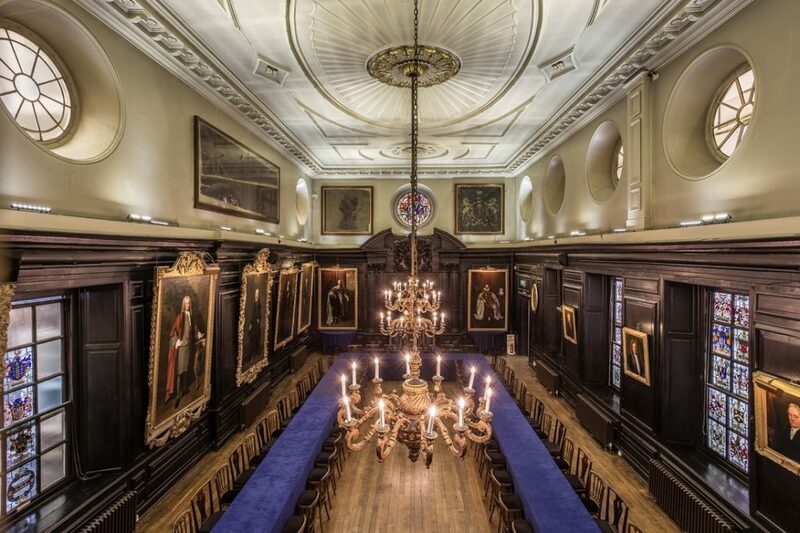 The Livery Hall – has a rich display of 16th and 17th century arms and armour. The three George II brass chandeliers have been in constant use since they were made in the mid-1700s and together with the Men-at-Arms candelabra, provide a unique candle-lit setting for banquets. The Drawing Room – also known as The ‘Gold’ Room, it is dominated by many magnificent paintings and on the floor is a superb copy of the famous Ardebil Persian carpet at the Victoria & Albert Museum. The Court Room – this elegant and beautifully proportioned room has a fine Regency dining table with late 18th century mahogany chairs and contains Dutch and Elizabethan paintings together with the impressive Grant of Arms, 1556. The Library – a quiet oasis at the heart of the Hall with an attractive George II mahogany bookcase and some interesting Dutch and Scottish paintings.